Zamfirescu Racoti & Partners took shape in the mid-1990s, just as the Romanian legal market began to liberalise. Headed by Calin-Andrei Zamfirescu, the firm made its international arbitration debut as counsel to the state agency managing Romania’s privatisation programme. It won its first case, over a cancelled US$238 million oil refinery sell-off, which opened the door to later privatisation disputes. Later it branched out into construction, representing one of Romania’s biggest companies in this area (Bog’Art) in a series of cases beginning in 2003. The firm has since built upon this area, with partner Cosmin Vasile known for his FIDIC expertise. The firm picked up its first instruction in an investment treaty case in 2007 – a US$10 million UNCITRAL matter for which it co-counselled with White & Case. A US$140 million ICSID dispute followed three years later, and this has led to more investor-state work. Zamfirescu and Vasile both sit as arbitrators. The team includes recently promoted partner Alina Tugearu. Romanian state entities regularly use the firm for commercial matters, including energy holdings company SAPE, the country’s largest energy producer Hidroelectrica, the National Agency for Mineral Resources and motorway authority CNADNR. The firm is also defending Romania against an ICSID claim brought by Swiss energy company Alpiq over the insolvency of Hidroelectrica. Other clients include OMV Petrom, Alro-Vimetco, Arcadis France SAS, DIWI Consult International, Societa Edile Costruzioni e Lavori, Group Investment Portico and the Saint Gobain group. The firm made headlines in 2017 when it won more than €400 million for Romanian state entity SAPE in an ICC case against Italy’s Enel over a put-option clause in a privatisation agreement for a power distributor. 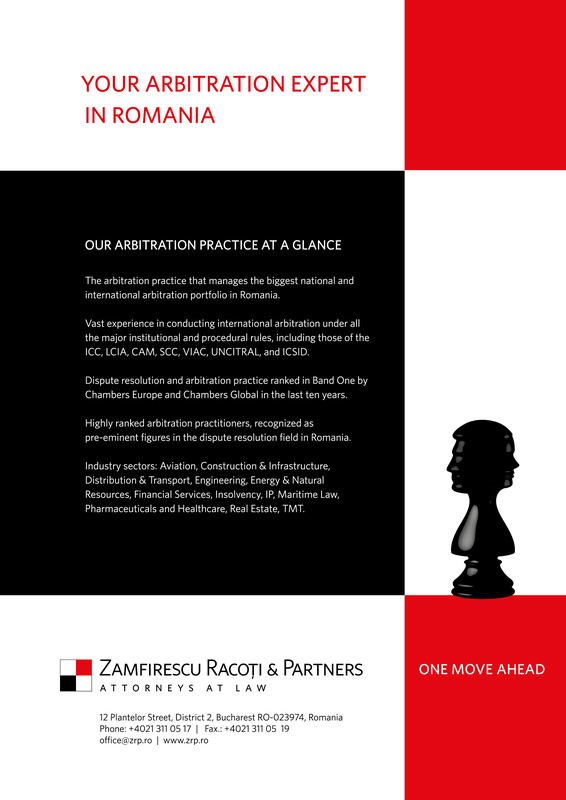 The case was one of the largest commercial arbitrations to come out of Romania in recent times. It had a win for its client DIWI Consortium in 2011, obtaining US$13 million in a dispute with a public authority over a technical assistance agreement. The firm had a win for Romania’s National Mineral Resources Agency in an ICC case brought by Chevron over the termination of three shale gas concessions. The tribunal dismissed claims by Chevron and ordered it to pay the agency more than US$73 million for terminating the concessions without complying with financial obligations set out in the country’s petroleum law. Impressively, Zamfirescu Racoti was sole external counsel to the agency in the case, while Chevron relied on a high-powered team from Three Crowns and DLA Piper. In another matter for SAPE against E.ON, which concerned the German utility’s exercise of a call option, the firm prevailed in 2017 on part of the client’s counterclaim, winning US$1 million plus interest in compensation for dividends that E.ON had failed to distribute in its role as majority shareholder of a Romanian energy concern. It is also representing a large Italian construction company in an arbitration with a Romanian company. Zamfirescu is also acting for Romania’s state-owned motorway company CNADNR in two disputes worth a combined US$100 million. In one of the cases, a merit hearing took place in June 2018, and the proceedings have recently closed. In the other case, Zamfirescu is representing the client in set-aside procedures for a partial award. The firm, working with co-counsel Norton Rose Fulbright, is also representing Austrian company OMV in an ICC dispute opposing the Ministry of Environment, in a case relating to the contractual dispute over environmental costs stemming from the privatisation of Romania’s largest oil company, SNP Petrom. In question is US$70 million. The full statement of claim was submitted in August 2018. Laura Voinea, legal director at Romania’s state assets administration authority, praises the firm’s capacity to respond to requests and mobilise at short notice. “This rapidity in their reaction as well as the professionalism of their advice clearly distinguishes them from other companies,” she says. The team also demonstrated impressive knowledge of private international law and environmental law. Zamfirescu Racoti & Partners (ZRP) is a leading law firm in Romania, assuring both business and dispute resolution support and representation. Presently, Zamfirescu Racoti & Partners benefits from the contribution of a total number of 53 attorneys highly specialized in various business-related law areas. ZRP manages the biggest national and international arbitration portfolio in Romania, handling arbitrations conducted under the auspices of numerous arbitral bodies or rules including the ICC International Court of Arbitration Paris (“ICC”), the London Court of International Arbitration (“LCIA”), the Camera Arbitrale Nazionale et Internazionale di Milano (“CAM”), United Nations Commission on International Trade Law (“UNCITRAL”), and the International Centre for Settlement of Investment Disputes (“ICSID”). ZRP also offers legal assistance and representation services in multimillion-value disputes held under the auspices of The Court of International Commercial Arbitration attached to The Chamber of Commerce and Industry of Romania.